Sibiu / Hermannstadt - sixnationscups Webseite! 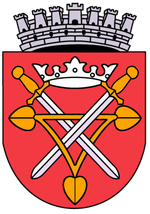 "Municipiul Sibiu - Hermannstadt" is emblazoned in German and Romanian on the entrance sign of Marburg's Romanian twin city. At the beginning of the 12th Century the Hungarian kings of the Arpad Dynasty brought in German settlers to secure the border to Transylvania, many of whom settled in Hermannstadt / Sibiu and its surroundings. Although a massive exodus of these Saxons to Germany began in the early 1970s, German culture and lifestyle is still found in Sibiu / Hermannstadt today. The local German Bruktenthal School offers A levels for attending a university in the Federal Republic of Germany, and the "Hermannstädter Zeitung" publishes articles in German. The mayor is of German descent, and is a member of a German minority party. Sibiu / Hermannstadt is one of the cities where the population rose at the start of the Romanian Revolution against the communist regime in December 1989. Romania began to restore democratic values and to develop a market economy in 1990, a process which is still ongoing today. In 2007, Romania joined the European Union together with Bulgaria. The county seat of Sibiu / Hermannstadt is one of the most beautiful medieval towns in Transylvania. Its medieval fortifications, Gothic churches, Renaissance and elegant Baroque palaces give Sibiu / Hermannstadt a charm all its own, making it worthy of being named a Heritage Site. Visitors can experience eight centuries of urban history in the city centre with its three main squares. Sibiu / Hermannstadt was the European Capital of Culture in 2007, but even before and after winning this distinction, its festivals and events were and are well worth a visit. Sibiu / Hermannstadt is prosperous centre in the heart of Romania. Thanks to extensive investment from Austria and Germany, its economy has been growing strongly since 2000. Marburg's Romanian twin city has the Lucian Blaga University, making it an educational centre like Marburg.